Incredibly delicious. Yukon potatoes have a rich nutty taste on their own- and they abundant locally now in Western Mass. In this side dish they are showcased with the perfect amount of dressing that is sure to please all kinds of palettes. There is a perfect balance between sweet, salty and sharp- the lemon is not necessary but adds a brightness to the flavor. This salad is a winner. Place the cleaned potatoes into a medium sized pot. Cover ¾ the way with water and add 1T salt. Bring the water to a boil and then reduce the heat and cover and cook them partially covered for 10-15 minutes, until they are tender but they still maintain their shape. Make sure they are cooked all the way through. Drain them from the water and allow them to cool slightly making them easier to handle, about 2-3 minutes. In a large mixing bowl, add the other ingredients together, the minced onion, celery, sweetener (I used raw agave), Veganaise, vinegar, mustard, olive oil, salt and pepper. Coarsely slice the potatoes into the bowl- I like large chunks so I will quarter the potatoes depending on their size. Mindfully mix the potatoes into the dressing, trying not to smash the potatoes up to much. Adjust the seasoning before serving. Serve warm or chilled garnished with fresh parsley. 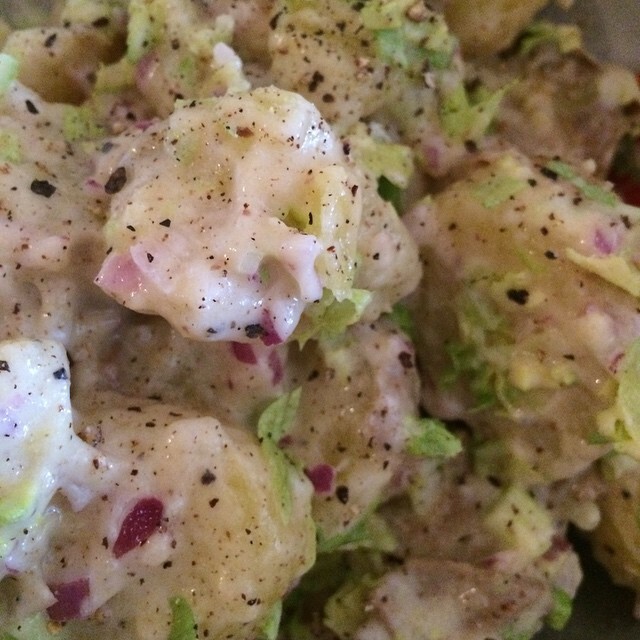 This entry was posted in salads, sides, Veggies and tagged comfort food, eat local, potatoes, vegan potato salad. Bookmark the permalink.